These hugely heavy and incredibly sensitive sets were, rumour has it, produced for Lend-Lease agreements with England for service in World War II. They are quite common in the UK but scarce in the US. There appear to be two 'flavours' of AR88 - the 'D' version has a frequency coverage as per above whilst the 'LF' version goes down all the way to 75kHz. The receiver consists of two RF stages, a mixer, local oscillator, three IF stages, a detector, noise limiter, BFO, AF amplifier, output stage and power supply system. The IF amplifiers incorporate variable selectivity and a crystal filter. The sets are normally housed in steel cases but can be rack mounted. The receivers are designed for coupling to a 200 ohm transmission line, except on low frequency general broadcast bands. For these and general use a single wire 25 to 50 ft. long can be used. 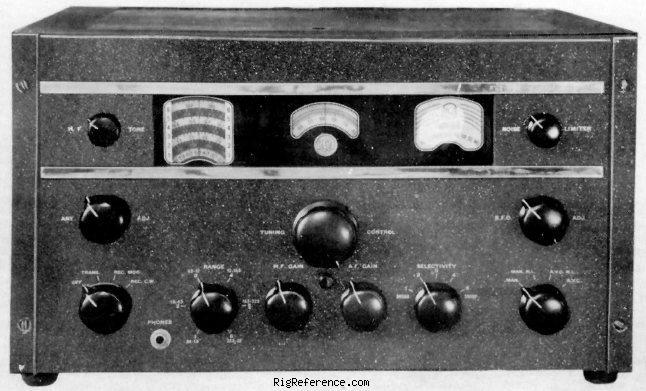 The Reception set AR88D was originally manufactured as the Reception set AR88. It still bears this name on the front panel. The change in designation occurred between the serial numbers 003000 and 010000 and coincides with a change in the design of the output transformer to provide a 600 ohm balanced line output and a 20,000 ohm headphone output. The original AR88 featured a 20 ohm headphone output. Estimating the value of a rig can be challenging. We collect prices paid by real hams over the years to help you estimate the current value of the RCA AR88D. Just bought or sold this model? Let us know what you traded it for and help other ham operators!